Here’s a wonderfully fresh, green and festive Etsy Treasury for you to feast your eyes on; Irish Spring for St. Patrick’s Day combines many of our favorite little finds on Etsy and just in time for the St. Patrick’s Day holiday! Personally, my favorite color is green, so any excuse to make a list of green items I wouldn’t mind owning is just plain fun for me! Now that the suspense of who made it the Super Bowl is over, we can all start planning our parties right? 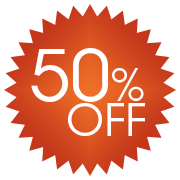 We are here to help with a special offer for the occasion. 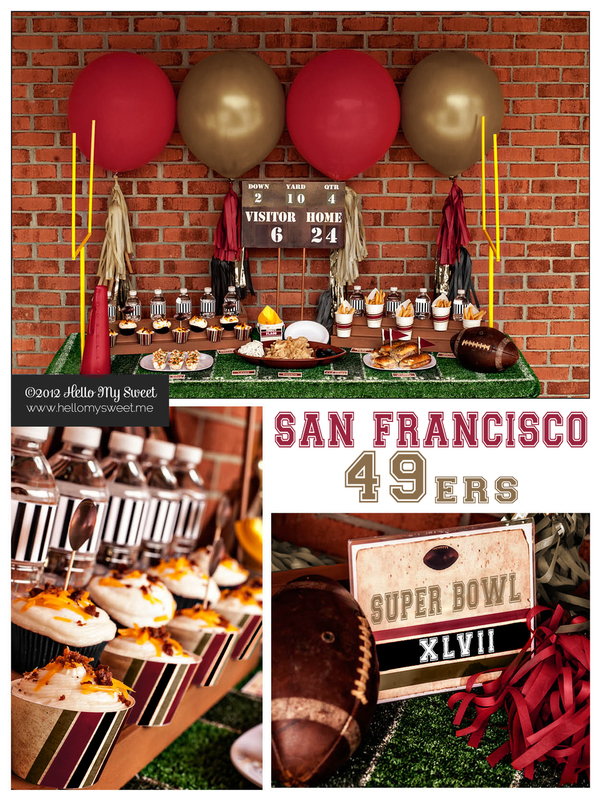 Our Super Bowl Party Printables have been customized to suit either the San Francisco 49ers or the Baltimore Ravens. Pick your team, tell us your custom information, and let us do the rest! 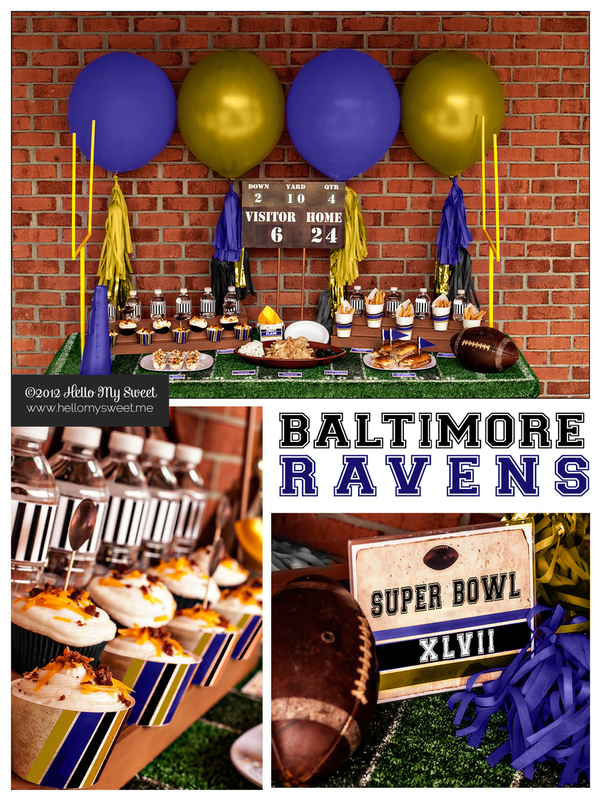 Visit our shop HERE to order your Super Bowl Party Printables, available now for only $20 (regularly $25). We were asked by Carmen of The Flair Exchange a while back to curate a list of holiday gift ideas for couples. We love The Flair Exchange and encourage you to hop on over to her blog and check out the rest of her gift guides this week as well as her amazing Tissue Tassel products! You can find and purchase the items pictured above on Etsy at the links provided below. Cyber Monday SALE, 1/2 OFF in Our Etsy Shop! Take 1/2 OFF your purchase in our Etsy Shop, TODAY ONLY! *Use Coupon Code: THANKS2U at checkout. *Offer excludes custom designed parties. 1/2 OFF Sale, 24 Hours Only! For the next 24 Hours you can take 50% off the cost of any Full Party Set in our Etsy shop! Orders must be received by NOON tomorrow, 11-15-2012 to qualify for the discount. Etsy, Etsy, Hear All About It! In case you haven’t found out about the most wonderful online retailer in the world, we are going to introduce you to it today. It is called ETSY.com and featured wares and wonders from the likes of people JUST LIKE YOU. People who are crafty, artisans, DIY types. People who have ventured forth to sell their creations in a storefront designed just for them. A new small business is created on Etsy everyday, perhaps many of them in fact. Etsy supports the everyday small business owner by providing a platform for them to sell on. Hello My Sweet is no exception, having been on Etsy now for about a year and a half. It allows us the freedom to create without the headache of trying to figure out how to sell our stuff! One awesome feature of Etsy is the Treasury. If you a member or shop owner you can create Treasuries, which feature items you have found on Etsy. Some of the more popular Treasuries act as a gift guide or are themed with one central idea or design. We really enjoy browsing the site and scouring thousands of items to build our own Treasuries. Today we thought we would share some of those with you! We encourage you to support small businesses everywhere by shopping on Etsy as opposed to some large faceless retailer. We promise you won’t be disappointed. These are shop owners who want your business, value your business and strive to make you, the customer, HAPPY. They really care about the fact that you have chosen to shop with them. To us that is really important as a consumer. A shop who really appreciates the fact that you are spending your hard earned dough with them. Shouldn’t you be rewarded for your choice? Go ahead, give Etsy a shot.